A new research report on the global ozone generators market presents an accurate analysis of the market scenario across vital regions all over the world. The report has been prepared with the motive of delivering high accuracy with valuable insights by our team of expert analysts who have carried out a strong research program to get the required results. The report includes crucial data associated with the market and covers intelligence right from market value to growth rate as well as pricing analysis. In addition, the report consists detailed market segmentation and competitive analysis. The results of analysis is based on the macroeconomic factors, the trends that are governing the market, the drivers that have supported the growth of the market and also the restraints that are limiting the market’s growth. This can assist the readers in gauging the opportunities arising in the market for them or the right time for grabbing the opportunities that can support them to grasp a major hold in the industry. The research report covers an in depth market segmentation that covers all market angles portraying a holistic intelligence report that can be vital in assessing prospects to gain market share in the respective segments across regions. This study includes analysis on each segment with respect to a global perspective and also includes a region wise information dashboard on all the segments. The report on global ozone generators market has 4 major segmentation types, based on capacity, production method, application type and region. The report depicts an individual analysis on every segment. The regional segmentation also helps the readers to know the most lucrative regions where the businesses can grow. This comprehensive research report has been prepared with the help of a unique research methodology. The process includes an in-depth primary and secondary research. It is carried out by first identifying the market size, key market players and the top products. Also, sets of questions are designed which are used in gathering information from the industry experts and subject matter experts across the globe based on which key insights are drawn. The data is also collected from various other trusted sources like company websites, company annual reports, white papers, etc. Once the data is gleaned from all sources, a validation process is carried out. Data is validated by triangulation method, wherein primary, secondary, and FMI analysis contribute to the final data, taking its accuracy to a higher level. The research report provides the necessary information that covers every aspect of the global market. The data covers the dynamics prevailing in the market that have an impact on the market’s growth. The information can be of great assistance to businesses that are looking for opportunities to excel in the industry and to compete effectively in the forthcoming years. It presents a brief profile of all major players in the global ozone generators market, to help the readers know the current strategies of these major players and also their upcoming plans to gain competitive advantage. Moreover, a systematic and organized structure of the research report makes it user friendly to read and draw necessary conclusions. Ozone is one of the strongest oxidizing agent owing to which it is utilized in purification processes. Ozone is produced by two methods- UV radiation and corona discharge with electrical charge by ozone generators. These generators are capable to produce ozone in amount ranging from few milligrams to hundreds of kilograms. The type and capacity of ozone generator depends on a number of factors such as ozone concentration, running time, kind of water treated, ozone dosage etc. One of the primary applications of ozone generator is for water treatment and air purification across end use industries. Moreover, ozone generator is also used in food & beverages processing and chemical industries for purifications. In chemical industries, ozone generators reduce energy during bleaching process without using heat, by eliminating chemical use thus reducing the amount of time needed to carry out the entire process. 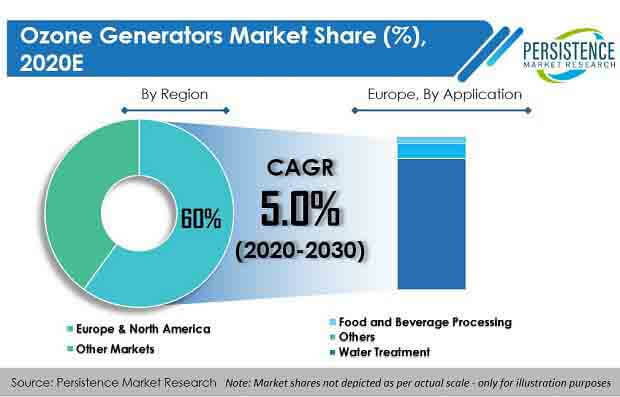 Among various applications of ozone generators, water treatment segment leads the market with the highest expected market value of over US$ 100 Mn by the end of 2025. In addition, among the sub segments of water treatment segment, the municipal water treatment sub segment is growing at a higher CAGR thus contributing the most to the growth of parent segment. Injection level- It is hard to maintain the level of chlorine in water. Ozone, on the other hand, can be injected in adequate amounts with proper installation. Moreover, when it comes to disinfection, ozone is considered to be 3000 times more effective than chlorine. As a result, the growth in adoption of ozone generators is expected, owing to growing awareness among people about the benefits of ozone. Also, growing regulations by environmental agencies such as EPA to monitor the maximum allowable limit for disinfection by products will in turn drive demand for ozone generators in the coming years. Earlier, the use of ozone generators was limited to water treatment and waste water treatment. However, lately, ozone generators have been widely used for non-conventional applications, for instance to improve the performance of extrusion coatings. Adding ozone to the process allows for lower extrudate temperatures thus allowing the use of lower temperature resins (EVAs). Ozone can improve various properties, such as bonding characteristics, heat sealability, color and odor, thereby adding to the product value. Moreover, ozone is also used for pulp bleaching and has replaced the conventionally used chlorine dioxide. The use of ozone has also led to a significant reduction in bleaching costs. Additionally, dissolved ozone is also used in semiconductor cleaning applications (wafer-cleaning and resist-stripping applications) and is used as an effective alternative to sulfuric acid.